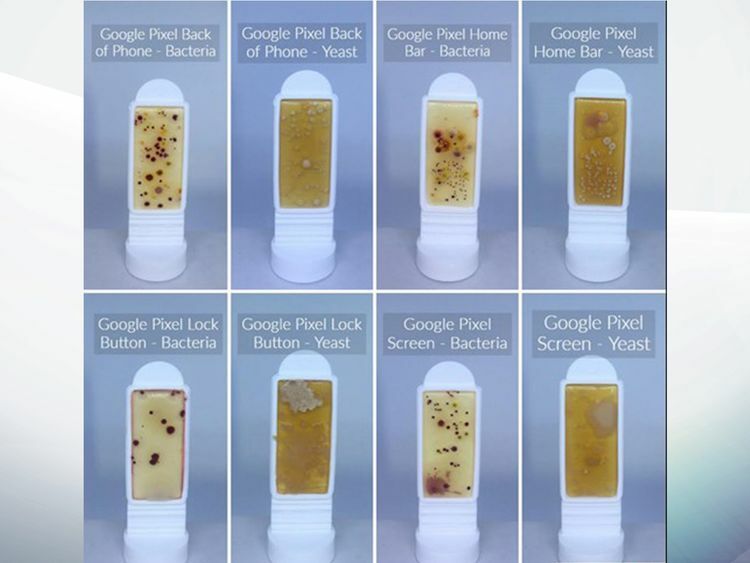 One in 20 smartphone users was found to clean their phone less than every six months.The firm swabbed three popular handsets - an iPhone 6, a Samsung Galaxy 8 and a Google Pixel, to test for aerobic bacteria, yeast and mould.The results revealed that all key areas of the the phones harbour at least some quantity of each type of substance. Insurance2go measured the dirtiest parts of the phones by counting the amount of colony-forming units per cm2.The units are used to measure the number of viable bacteria or fungal cells in a sample.The screens of the three handsets had a combined total of 254.9 colony-forming units per cm2, making them by the far the filthiest parts of the phones that were tested.This mean there was an average of 84.9 units on each screen.In contrast a toilet and flush was found to have just 24 units, while an office keyboard and mouse was found to have just five. The test found the back of the phones had an average of 30 units, the lock button had an average of 23.8 units, and the home button had an average of 10.6 units.The Google Pixel had 14.5 colony-forming units on its screen, another 14.5 on its lock, while 24 were found on the home button and 24 were on the back.The iPhone 6 had 40.4 units on its screen, 42.5 on the lock, another 42.5 on the back and 2.9 on the home button. 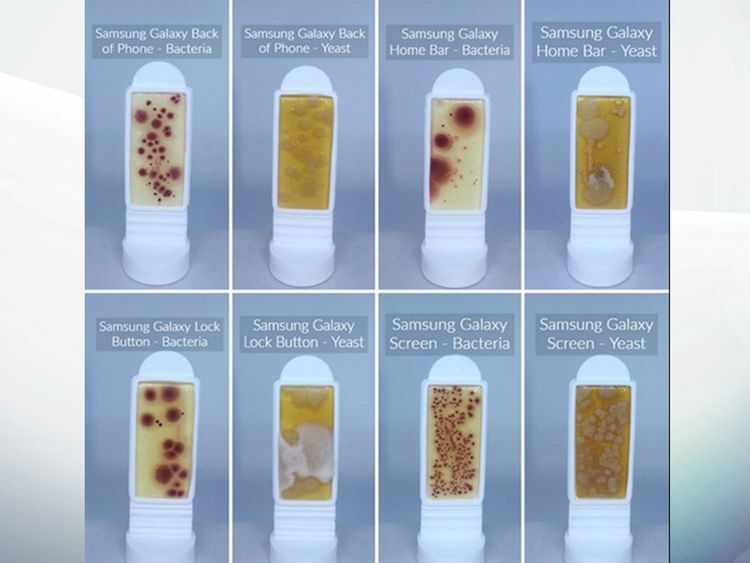 Researchers found that the Samsung Galaxy 8 that was tested had the dirtiest screen with 200 colony-forming units, while 14.5 were on the lock, five were on the home button and 24 were on the back.The results do not suggest that one type of phone is more likely to get dirty than another. Insurance2go has released the findings after Ofcom shed a light on the UK's smartphone addiction, with owners checking their handset every 12 minutes.Dr Shirin Lakhani of the skin clinic Elite Aesthetics said: "Our smartphones are a really big source of skin contamination and skin problems; namely acne. "Skin friction, heat and pressure to the skin all contribute to skin problems caused by smartphones." Gary Beeston, sales and marketing manager at Insurance2go, said: "Our phones are never far from our sides; we take them everywhere with us. "Therefore, it's inevitable that they'll pick up a few germs along the way. 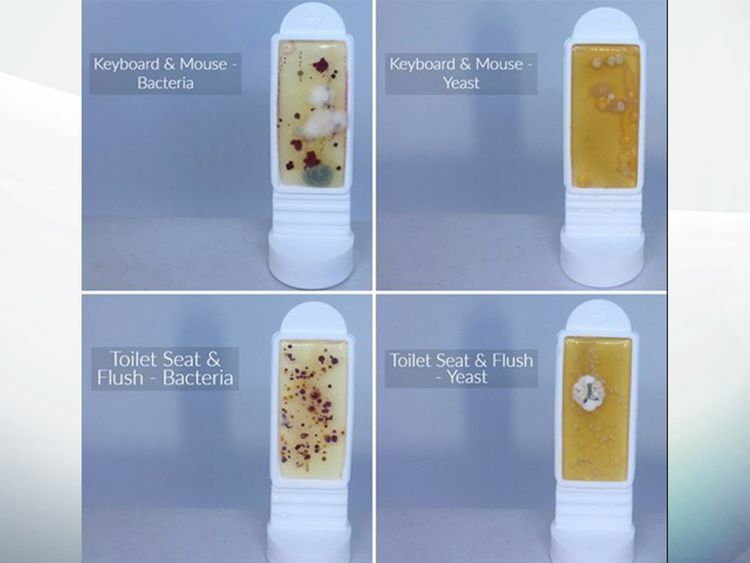 "In our experiment we took the germs that are normally lurking on our phones invisibly, and placed them in ideal growing conditions to help people see the potential hidden germs. "Perhaps we don't realise quite how infectious our phones can be considering we're holding them against our faces! "The three mobile screens we tested were almost 4x as infectious as the next most infected feature, the back of the phone. 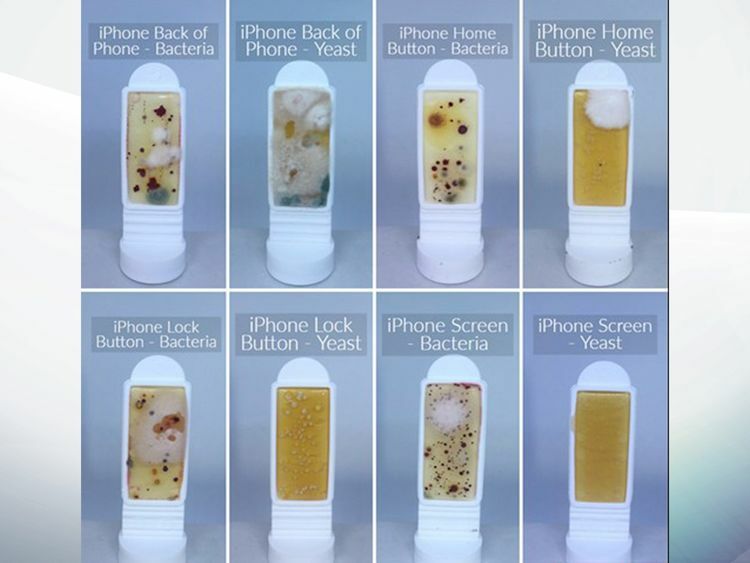 "As Dr Lakhani suggests, consider using alcohol wipes to disinfect your phone every now and again. Taking good care of your phone will help your technological investment to last longer, and stay in better condition." » Leaked Image of Google's New Pixel Smartphone?